You may have been to a clothing swap before, but have you ever been to a SWAPPING MALL? 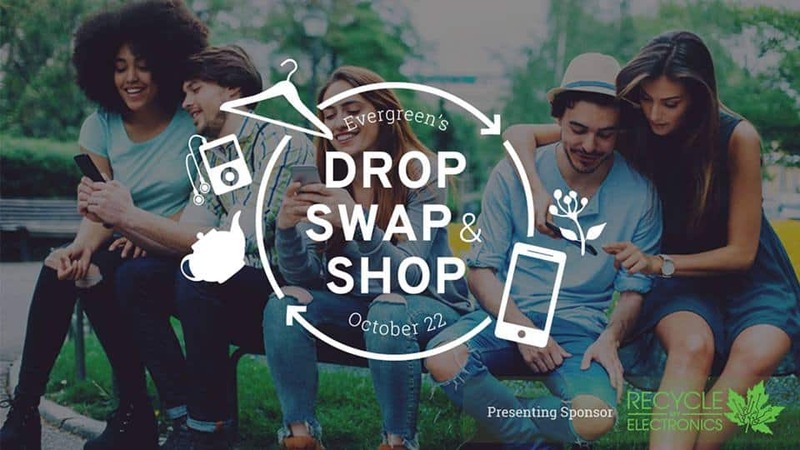 Head to Evergreen Brick Works (550 Bayview Ave.) on Sunday October 22nd from 10 a.m. to 3 p.m. for Drop, Swap & Shop. Purge your closet, recycle your electronics, and nab some new-to-you items while you’re at it. There will be a killer selection of goods in the following categories: Baby Supplies, Kids’ Clothing & Toys, Women’s Clothing & Accessories, Men’s Clothing & Accessories, Housewares & Art, Media/Entertainment, Sports & Rec Equipment, and more! For each item you drop off you will be given 1 ticket in return. Recycle My Electronics will be on site to help you recycle your end-of-life electronics in a safe and sustainable way. Plus, you’ll get free entry to the swap when you recycle an end-of-life electronic. Swapping is good for your community, the environment, and your wallet!